Will Some Nations Experience Economic Prosperity In The Tribulation Period? Title: Will Some Nations Experience Economic Prosperity In The Tribulation Period? Subtitle: Incredibly, Biblical prophecy seems to foretell that some nations will continue to enjoy economic prosperity through a portion of the 7-Year Tribulation Period! 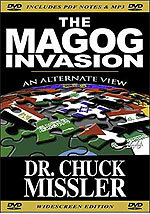 Even though a great deal of economic disaster will accompany the Third World War which is planned to produce Antichrist, certain major nations may be able to restore economic prosperity rather quickly as their leaders transition the failed individual economies of the world into a single global economy built upon the foundation of a new global currency -- which shall be neither the Euro nor the Amero. Biblical prophecy seems to foretell that material prosperity may then continue some time into the Tribulation Period. We believe that this time of prosperity may continue until approximately the mid-point of the Tribulation Period, after which God's judgments and Antichrist's insanity will bring this prosperity crashing down. This prophecy is very interesting, as it lists two (2) types of nations in the world at that time. However, at first glance, it seems to be contradictory in its two parts. "A quart of wheat for a denarius [a whole day's wages], and three quarts of barley for a denarius..."
2) Wealthy Nations -- On the other hand, "oil" and "wine" are traditional Jewish symbols for wealth and prosperity. It seems as though God has another group of people at this point in the Tribulation Period whom He is temporarily shielding from the judgments falling upon the first group. "... but do not harm the oil and the wine!" Indeed, I believe there are two groups here, and they seem to be the same two groups of nations whom the Illuminati has identified in its writings. A) The first group is the "Non-Integrating Gap States" as we explain in NEWS1833. Let us quote pertinent excerpts from NEWS1833, one of the most important articles we have ever posted. Nations who are not now functioning in the Global System and are not likely to do so in the foreseeable future, unless they are kicked into it by U.S. or European troops, or by the threat of invasion. These nations are called the "Non-Integrating Gap". The strategy being followed by the United States and the European Union is to "shrink the gap". Now, listen to the arrogance of this Pentagon planner. Is this what President Bush's "War On Terrorism" is intended to do: allow Washington to "take real ownership of Strategic Security"? I believe this is exactly the goal in view here. Individual nations -- mostly poor, third world -- are facing the real threat that Western Illuminati countries led by the United States are invading or threatening to invade "Non-Integrating Gap" countries so they can take "real ownership of strategic security". We have already taken control of the "strategic security" of Iraq, have we not? And, our forces are reportedly massed on the borders of Syria and Iran, as we threaten them with the military force we deem necessary to take control of their "strategic security"! Is it any wonder these countries are diplomatically fleeing to Russia for protection and are banding together to fight the "Great Satan"? We have shown below, a map of the Non-Integerating Gap countries. 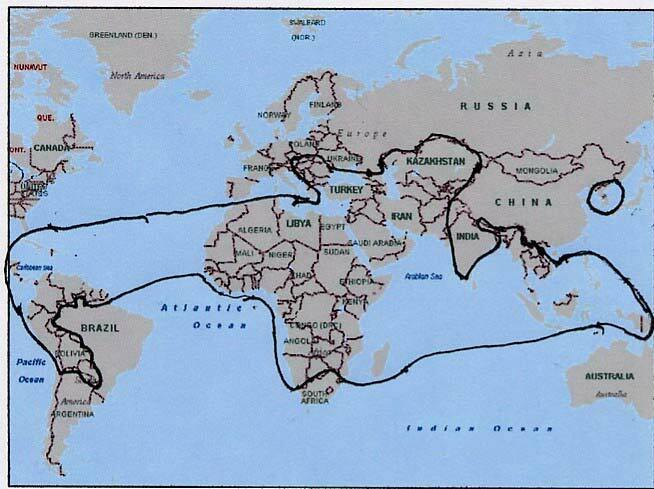 We have encircled this region in black ink. As you can instantly see, the world truly is on fire from continuous wars in this region! Every single day in our Daily News Updates, we show the news from countries within this region. On page 176, the author puts this matter in a different way: "Any time American troops show up -- be it combat, a battle group pulling up off the coast as a 'reminder', or a peacekeeping mission -- it tends to be in a place that is relatively disconnected from the world, where globalization hasn't taken root because of a repressive regime, abject poverty, or the lack of a robust legal system. It's these places that incubate global terrorism. Draw a line around these military engagements and you've got what I call the Non-Integrating Gap." Our invasion of countries like Iraq in Gulf Wars I and II, with the resulting death and destruction of civilians and infrastructure in its wake, is arrogantly written off as "away games"! Can you begin to understand how the people living in these "Non-Integrating Gap" nations hate us? Look above again to see the map of a full Pentagon listing of all "Non-Integrating Gap" countries and/or regions. This group of poor nations -- clearly identified on the map in this article -- are probably in view here, when God's judgment falls in this Third Seal Judgment. B) The second group of this prophecy can be thought of as the Illuminati's "Core Functioning States", whom God seems to be protecting as He commands, ""... but do not harm the oil and the wine!" These are the nations whose economies can quickly meld into the planned "Cashless" economy of Antichrist. For some reason, God has seen fit to delay their judgment for a short while. As God's Judgment falls in this Third Seal, He throws the poor nations into such poverty and despair as to be almost unbelievable, but for some reason, He simultaneously commands that the prosperous nations are protected, at least temporarily. This next prophecy which we are going to examine seems to show that, finally, the time had come for God to bring wealthy nations into His Judgment. 1) "Because in one single hour all the vast wealth has been destroyed (wiped out)" -- Obviously, if this nation's "vast wealth" was wiped out suddenly in one literal hour, this nation possessed that great wealth just before God's Judgment fell. Jesus boldly stated the same truth in Matthew 24. Literally, these prophecies are telling us that some degree of prosperity and of cultural normalcy will continue in some countries right up until the final fiery destruction falls upon the wicked. When God finally delivers His final judgment, these prosperous wicked people will be totally surprised as they suddenly meet their doom. 2) "And all ship captains and pilots, navigators and all who live by seafaring, the crews and all who ply their trade on the sea, stood a long way off, And exclaimed as they watched the smoke of her burning..."
Why were these ship captains and all who earned their living from the Sea moaning and groaning so vehemently? They had just seen the major country in the world who purchased so much merchandise from overseas and shipped it in via ocean freight, suddenly destroyed by fire in one literal hour! Quite obviously, these ship captains were grieving so much because they realized that no other nation on earth could replace this destroyed nation. Indeed, Americans lead the world in the way we purchase. We buy hard goods, for example,. like homes and cars, and own them for a very short while before selling them and buying something new. American consumers also lead the world in the smallest savings rate and in the rate at which we buy on credit card! These ship captains understand reality quite correctly. No other nation or group of nations can replace this condemned nation. But, the very fact that they are lamenting this loss so greatly means that buying and selling and the accumulation of material wealth is continuing at least up to that point in the Tribulation Period! "It is done! It is all over, it is all accomplished, it has come!" The action in the Book of Revelation does not resume then until Chapter 19. Thus the events of Chapters 17 and 18 are parenthetical and can occur at any time in the Tribulation Period. Therefore, the events of Revelation 17 and 18 can happen at any time after the beginning of the 7-Year period. Most scholars believe Revelation 18 will occur sometime toward the end of the first half of the Tribulation Period. In fact, many scholars believe that the first half of Revelation will be relatively peaceful and prosperous. For some reason, God has planned that the poor wicked shall receive His physical judgment early in the Tribulation Period, while He delays the final judgment of the wealthy for some later time. Why would God plan His judgments in this manner? Since the Illuminati Plan to produce Antichrist has been carried out by the most wealthy leaders of the world since 1776, I believe God is allowing their sin to accumulate just a little while longer. The Bible reveals that, in God's mind, the sin of a person -- and a nation -- builds up gradually before God decides to deliver His judgment. Obviously, it took a long, long time for this nation's sins to pile up like wood until the stack reached "as high as heaven". God gave this nation plenty of time to repent of her sins and turn to Him with a collective heart broken with sin. But, this nation refused. The Apostle Paul actually tells the sinner that God does not deliver His judgment immediately after sin, giving the sinner the space of time he needs in order to turn and repent and forsake his evil ways. In like manner, God is allowing the sins of the wealthy to continue to pile upward toward Heaven, giving them time in which to repent and turn to His Son for forgiveness and pardon. Of course, the wealthy of this nation refuse. During the first part of the Tribulation Period, God does not bring the rich into judgment right away, probably knowing that they will believe that their wealth will be their protection, that their wealth will deliver them through this troublesome period. But, finally, even the rich man is brought to ruin, and when they realize it, I believe they throw away that very material on which they had been depending, just as the prophet Ezekiel foretold prior to the judgment wrought by the Babylonians. "... wealth has been the stumbling block of their iniquity." In the final analysis, God seems to plan to allow the wicked rich of the Illuminati to keep their coveted prosperity and their wealth for a while during the first part of the Tribulation Period. But, when sin has reached its fullness, God's judgments finally fall, to the utter ruin of the rich man and his wealthy economy.